IBA Institute of Business Administration Karachi Sindh. The Institute of Business Administration, a leading business school of the region, seeks the services of self-motivated, proactive, and customer-oriented library and information science professionals who are eager to excel in a challenging work environment. IBA's Library is one of the top notch academic research libraries of the country equipped with modern facilities in accordance with international standards. 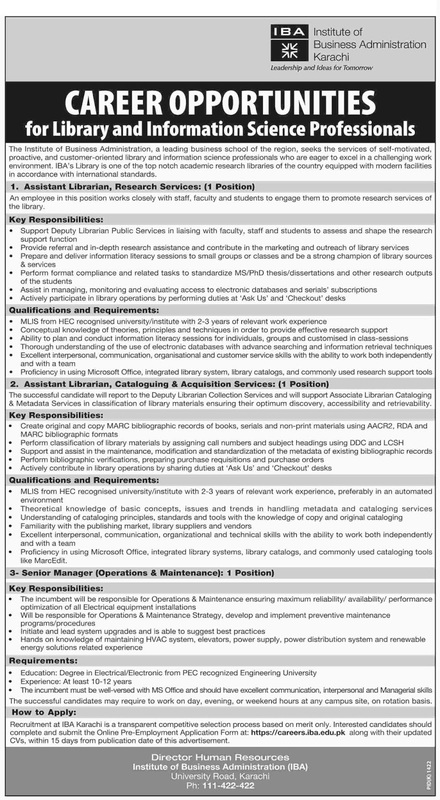 An employee in this position works closely with staff, faculty and students to engage them to promote research services of the library. • MLIS from NEC recognised university/institute with 2-3 years of relevant work experience. • Conceptual knowledge of theories, principles and techniques in order to provide effective research support. • Ability to plan and conduct information literacy sessions for individuals, groups and customised in class-sessions. • Thorough understanding of the use of electronic databases with advanced searching and information retrieval techniques. • Excellent interpersonal, communication, organisational and customer service skills with the ability to work both independently and with a team. The successful candidate will report to the Deputy Librarian Collection Services and will support Associate Librarian Cataloging & Metadata Services in classification of library materials ensuring their optimum discovery, accessibility and retrievability. • MLIS from HEC recognised university/institute with 2-3 years of relevant work experience, preferably in an automated environment. • Theoretical knowledge of basic concepts, issues and trends in handling metadata and cataloguing services. • Understanding cataloguing principles, standards and tools with the knowledge of copy and original cataloguing. • Familiarity with the publishing market, library suppliers and vendors. • Excellent interpersonal, communication, organizational and technical skills with the ability to work both independently and with a team. • Proficiency in using Microsoft Office, integrated library systems, library catalogues, and commonly used cataloguing tools like MarcEdit. • The incumbent will be responsible for Operations & Maintenance ensuring maximum reliability/ availability/ performance optimization of all Electrical equipment installations. • Will be responsible for Operations & Maintenance Strategy, develop and implement preventive maintenance programs/procedures Initiate and lead system upgrades and is able to suggest best practices. • Hands on knowledge of maintaining HVAC system, elevators, power supply, power distribution system and renewable energy solutions related experience. • Experience: At least 10-12 years. • The incumbent must be well-versed with MS Office and should have excellent communication, interpersonal and Managerial skills The successful candidates may require to work on the day, evening, or weekend hours at any campus site, on a rotation basis. Recruitment at IBA Karachi is a transparent competitive selection process based on merit only. Interested candidates should complete and submit the Online Pre-Employment Application Form at: https://careers.iba.edu.pk along with their updated CVs, within 15 days from publication date of this advertisement.